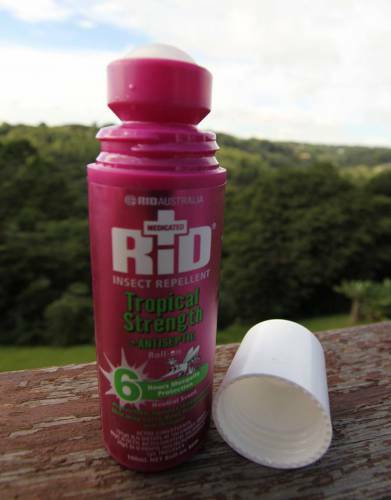 RID™ is one of the top Australian-made insect repellents currently available on the market. Packing RID™ Tropical Strength for your adventure is the wise choice for optimal performance. 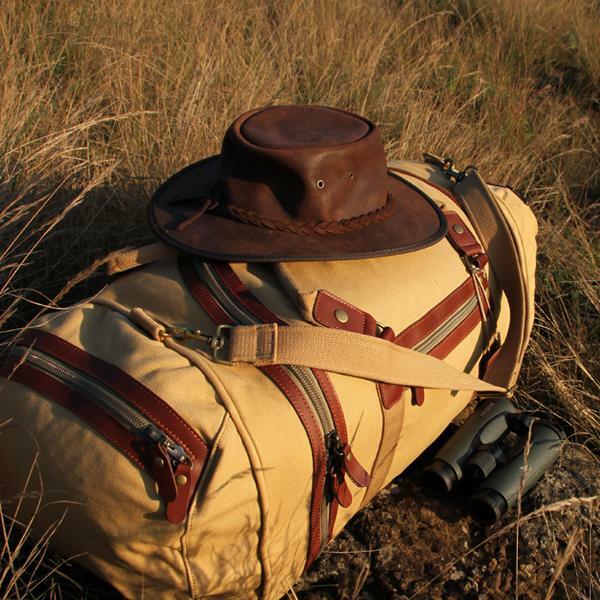 Tried and tested by our team on safari, on expedition, and in warm-weather destinations, RID™ has never let us down and comes highly recommended to all non-EU and non-UK clients. 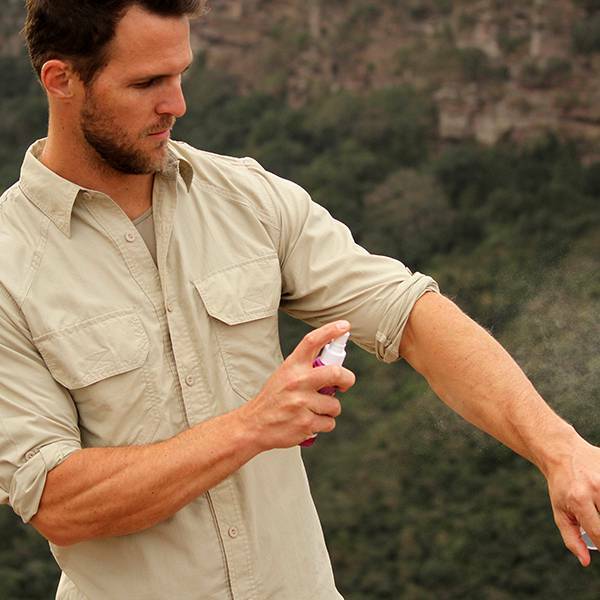 DEET is globally regarded as the most effective repellent products and is safe to use. With a carefully-developed formula and active ingredients for broad-spectrum efficacy, it is bug-proof technology at its best from the swamps and wilds of Australia. In a roll-on bottle, RID™ is a safari and outdoor staple for every traveller and adventurer – simply apply the milk to your skin with the roller-ball. Why pack RID™? The answer to that is very simple: because IT WORKS! RID™ will protect you from all biting bugs (mosquitoes, sand flies midges, ticks, fleas, and tsetse flies), mosquito-borne diseases, and those pesky flies, ants and leeches, just as it has been doing since 1956. RID™ also contains two additional repellents, including a fly repellent, that other insect repellents do not include in their formulae. Furthermore, RID™ contains antiseptic to kill a wide range of bacteria (introduced by the insect bite or by scratching the area around the bite) which helps to stop the spread of infection. The range is also medicated and contains Vitamin E for moisturising, chamomile for its soothing relief, and Triclosan (an anti-bacterial/inflammatory agent). Size of Bottle: 100ml. 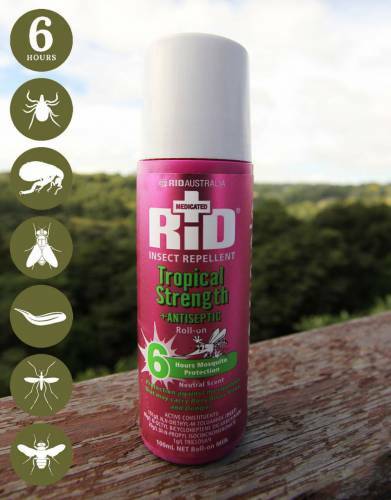 RID™ 19.5% Tropical Strength formula, as stocked by The Safari Store, lasts for at least 6 hours (tests show it is usually between 7 and 8) due to its additional repellent and synergists that extend the duration of protection. ⊙ THE MORE DEET THE BETTER? : This is simply not true. We have to be honest and say that, for a year or so, we believed that this was true - until we discovered leading Australian-made repellents. The Australian scientists behind our insect repellent brands have dispelled the "more DEET the better" myth bandied about by most insect repellent manufacturers (usually for marketing purposes). Through extensive tests, it has been proven that the effectiveness of the insect repellent does not increase once the level of DEET rises above 20%. What does increase is how long the product lasts on the skin. A standard 20% DEET repellent will usually last 4 to 5 hours. A product with 80% DEET will last for 8 to 10 hours. RID 19.5% Tropical Strength formula, as stocked by The Safari Store for export outside of the UK and EU, lasts for at least 6 hours (tests show it is usually between 7 and 8) due to its additional synergists that extend the length for which the product is effective. DEET at high concentrations is highly corrosive to your precious camera gear and binoculars - and to your skin! The World Health Organisation and most medical authorities recommend that DEET products be below 50% as levels higher than this are known to cause severe skin irritation. ⊙ KIDS & SENSITIVE SKIN: DEET has been classified as safe by leading global health organisations and regulatory bodies. Although many reputable sources claim DEET is safe for use in children from two to six months old, we recommend use for children aged three and up for good measure, as they will then be able to communicate if any irritation occurs. For non-UK and non-EU clients who are concerned about using DEET products on their children and infants, Kids RID™ contains 7% DEET and, in more than half a century of RID™'s history, they have not received any complaints regarding skin irritation across their range and Kids RID™ is the only product specifically available for children. When using RID™ on your children, avoid contact with their eyes, mouths, and hands. ⊙ HOW LONG DOES RID™ LAST? : The shelf life of RID™ is 4 to 5 years. Rather take an extra bottle with you than run the risk of running out while in areas with biting insects. ⊙ SPRAY OR ROLL-ON? : The RID™ Roll-on and RID™ Spray are of the same formula. The roll-on is a milky liquid and the spray is a clear liquid. The spray is a more popular seller as it is easier to apply and may be sprayed on to your clothing, as well as on to your skin. As you will see below, the roll-on is more effective against tsetse flies, but we have had success in tsetse fly bite prevention with both the spray and the roll-on. 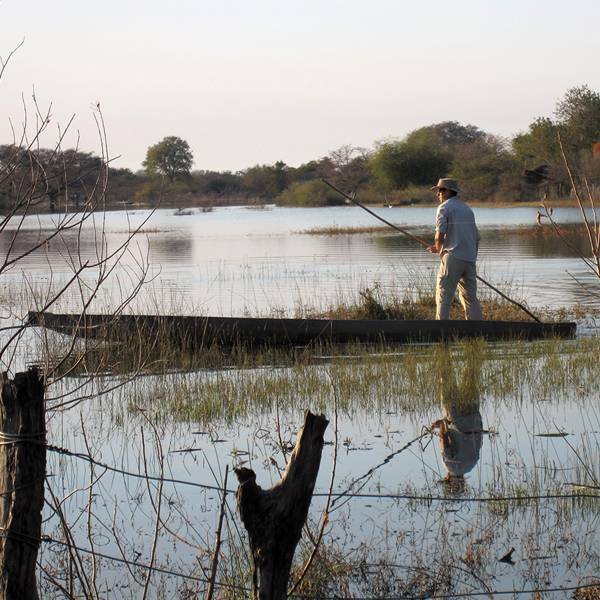 ⊙ THE RID™ STORY: RID™ began where all insect repellents should begin: not in a sterile laboratory, but in a swamp! Founder Doug Thorley started with the intention to create "an insect repellent that's pleasant to wear, soothing to the skin, and medicated for existing bites." To realise his dream, he researched with obsessive determination; he tested night after night for years. It was reported to the Brisbane police that a strange man was in the swamp with a dog. Doug was the original human guinea pig: standing in those murky waters being eaten alive night after night, taking notes, testing new lotions, until finally the formula was perfected. He wouldn't market anything if it hadn’t been tested on his skin first. His product was DEET-based - a chemical used by American soldiers in the Pacific during World War II. It worked extremely well but had an offensive odour. His kitchen research, with his wife's cosmetic cream, finally paid off. After more than 3,000 hours testing in the field, he was ready to sell a product that repelled insects, but with a pleasant scent. From day one in 1956, it was a hit. Soon, RID™ was being invited to picnics, beaches, barbeques, and outdoor adventures across the country. The familiar purple-magenta packs could be found in handbags and medicine cabinets everywhere. It would seem that Doug Thorley shared the notion of "Expedition Tested™" with The Safari Store a long time before our founder was even born. We believe it was Doug's hands-on, field-tested approach is the reason behind the product's high level of efficacy against biting insects. There are significantly less tsetses around when putting the RID on and I had a record of only 1 bite on a drive the other day where I normally would have between 15-20 painful bites. This is a great product and as a bonus it smells nice and clean too. First discovered Rid in Australia in the late 80s. Never use anything else even though holidays these days are in Europe. Never get bitten by mosquitos.